Until now, festival goers have had to brave the elements to have a chance of seeing their favourite bands. 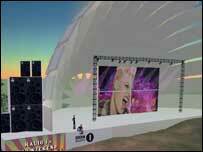 But BBC Radio 1 is changing this by giving music fans a chance to immerse themselves in the virtual festival experience. The idea kicked off in the real world last month when Dundee played host to Radio 1's Big Weekend. Some 30,000 lucky ticket winners and 34 live bands came together to take part in Europe's largest free music festival. Millions more listened over the airwaves and on the internet. But this year, there was a new way for revellers to take part in the festival. 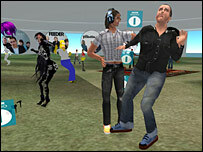 For the first time, Radio 1 piloted a simulation of the Big Weekend in an online, virtual world known as Second Life. 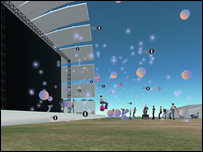 Representations of people in the world, known as avatars, were invited to teleport or fly to the Radio 1 Island where large screens were broadcasting live video. Over the course of the weekend the island saw more than 6,000 visitors from around the world getting down to bands like Pink, Muse and Snow Patrol. Just like the real world users they were taking photographs and blogging the experience. On the ground in Dundee the audience could see their virtual counterparts dancing around, getting virtually-wasted and soaking up the festival vibe on two huge video screens at the side of the stage. But now that the music has stopped, the loos cleaned and the stage empty what next for Radio 1 in virtual worlds? Radio 1's approach has been to harness the power of the web so coverage of events ripple out around the internet in many different forms. The One Big Weekend experiment was just the beginning of what might be possible in virtual networked worlds. Radio 1 have already had a number of requests from new and well-established bands to play on the island. We now hope we can make virtual places for our audience to come and experience new live music. However, much like MySpace on the web, our deeper aspiration is to discover new artists. We know our audience want to contribute their content, but not necessarily always on our site. Second Life is just one of many potential partners. To aid this, we are currently in the process of building a replica of the BBC's world famous Maida Vale studios where new bands can tune up and play live sets to a virtual audience. But simply simulating the event by broadcasting audio or video only begins to utilise the strengths of these online worlds. At Radio 1 we want to bring a new level of social interaction to our virtual broadcasts. 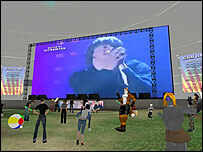 We are hoping that the bands featured on-air will have their own custom-built avatars, playing in the virtual world. So if we have the Red Hot Chilli Peppers playing a gig, visitors to a Radio 1 virtual space will see avatars of Anthony Kiedis and Flea, mimicking the action in the real world. We also believe it is crucial that the virtual audience can interact with the event. It is about replicating the "liveness" of an event, not just broadcasting it. Additionally, Radio 1 wants to find ways of allowing the audience in these worlds to actually affect the real event. I see no reason why they cannot be asking their musical heroes questions, alongside virtual Radio 1 DJs, either via Instant Messenger or VoIP. This deeper social interaction, that mirrors real world events, would do much to enhance the ripples that resonate around digital communities. Do avatars dream of electric racoons?